Constructing a new part is one of the most important steps to making a contribution to the synthetic biology community and the Registry. After adding a part to the Registry database, you'll find yourself in the lab, constructing a physical sample of that part. Maybe you're synthesizing an entirely new basic part, extracting one from another organism, or putting together a new device (composite part), we'll detail some the methods that you can use when constructing your parts in the lab. Don't forget the Registry's part submission requirements: all parts need to be sent to us in the pSB1C3 plasmid backbone. Regardless of the standard you used during your synthetic biology project you will need to make sure that the sample you send to the Registry adheres to the BioBrick RFC and is in the pSB1C3 shipping backbone. If you are constructing a part via direct synthesis, you will need make sure that there are no illegal restriction sites that would interfere with your standard's assembly. Based on the requirements for sending your part to the Registry (packaged in pSB1C3 plasmid backbone) your part will be flanked by the BioBrick prefix and suffix. Therefore the part will need to be BioBrick compatible, and cannot have the following restriction sites: EcoR1, Xba1, Spe1, Pst1. See the DNA synthesis page for more information. Most synthesizing companies will send your product back in their own specialized plasmid. 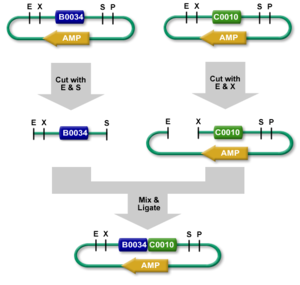 If you are able to include the prefix and suffix, required by your assembly standard, in the synthesis of your part then you will be able to cut your part out from their plasmid and into a Registry supported plasmid backbone. Otherwise, you can use PCR to extract your synthesized part and add on the appropriate prefix and suffix. Many interesting parts exist in nature or in your lab. You can use PCR to extract the DNA sequence to create your part and place the correct prefix and suffix on its ends. You will have to be sure that the part's sequence is compatible with the assembly standard you wish to use. You will also find that some available part samples from the Registry are not in a plasmid backbone that belong to your specific assembly standard. You can add your preferred standard's prefix and suffix in the same manner. Don't forget that part samples sent to the Registry, must be packaged in the pSB1C3 plasmid backbone. If you used a different assembly standard in the construction of your parts you can use PCR with BioBrick prefix and suffix primers that will allow you to transfer your part into pSB1C3. See the PCR Standardization page for more information. 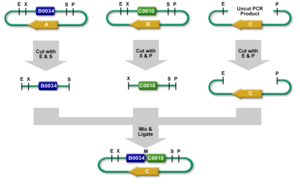 Site-directed mutagenesis is particularly useful if you need to remove illegal restriction sites to make your part compatible with your preferred assembly standard and BioBrick RFC. Purifying template plasmid DNA containing your part from a dam+ E. coli strain (ensures that template plasmid is methylated for digestion with DpnI). Designing forward and reverse primers, containing the mutation you want, that will bind to the correct region of DNA. Running a primer-extension reaction with a proof-reading, non-displacing polymerase such as Pfu DNA polymerase. This results in nicked circular strands of the plasmid. Cut up the template plasmid DNA with DpnI. Transform the circular nicked DNA into a highly competent cells. These cells will repair the nicks and not restrict the unmodified product DNA. Select colonies and test them (colony PCR, restriction digest, sequencing) to find your correct mutant. See the Site-directed Mutagenesis page for more information. I've constructed a part, now what? Now it's time to use and characterize it! The documentation that is provided along with your part will allow users in the Registry community to better understand the part before they use it.